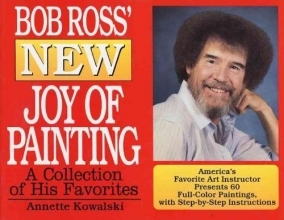 Since 1983, Bob Ross has been television's favorite artist. His "Joy of Painting" show captures higher ratings than any other art program in history, year after year. Bob's quick painting style and easy, encouraging manner reach millions of viewers around the world each day. His third book -- "New Joy of Painting" -- is now available in paperback, containing another sixty of his favorite landscape paintings. Each is presented in full color, along with written instructions and detailed black-and-white how-to photographs. Now you really can complete your very own beautiful masterpiece -- you can do it. "Remember, there is no failure, only learning," says author Annette Kowalski. "As I've heard Bob Ross say a thousand times, I hope you never create a painting that you're totally satisfied with, for it's this dissatisfaction that will create the motivation necessary for you to start your next painting, armed with the knowledge you acquired from the previous one."